Our preschool, like our nursery, focuses on exploratory labs as a foundation for sharing, allowing for learning through exchange, communication and play. Some of these are: drawing and painting, collage, reading and drama, dance and psychomotor skills, multimedia, music, logic, environmental education, and fine motor skills. All of these labs are age appropriate and occur in every group. Our educational programme includes a bilingual scope in which a mother-tongue English teacher collaborates with the other preschool teachers, following the general didactic work and coordinating various activities in symbiosis. In this way, children are in direct and continuous contact with the English language, providing kids with a solid understanding of the English language. This will allow them to forge ahead in their primary school English studies. 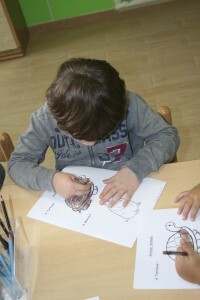 09.45- 11.45 The children are divided into groups and make two different activities according to the weekly program. Then, the play in the classroom or outside in the garden.